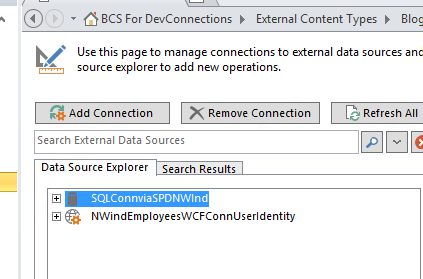 There are tons of examples (the #1 viewed blog above uses that as an example) on how to use SharePoint Designer to do a SQL Native Connection, so i wont bother beating that horse to death, and I would like to also point out to this excellent post by my good friend Chris Givens on how he extended the third bullet point example above to include Notification and Subscriptions Alert, so i will not be doing that either. As this is an update, I am specifically leaving out the precursor activities that are needed before you begin to create the External Content Type (ECT), I will just pick up at the point of Creating the ECT and as for cases where I introduce new methodologies, I will ofcourse showcase those aspects. Now by default you will get a Service Contract called (IService1.cs) and a Service Implementation (SErvice1.cs) – I don’t like using the OOB templates that are provided although hey say you can Rename/Refactor it; i just never trust it. So, you can go ahead and delete those, because we will create our own classes for our Data Contract, Service Contract and Service Implementation. 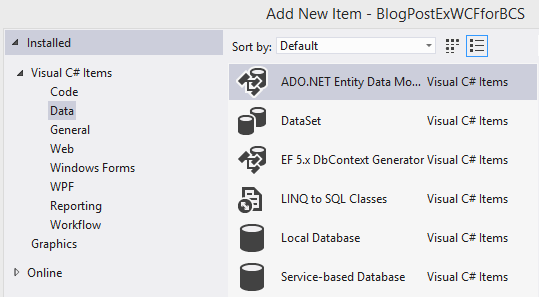 Once you have deleted those two files, then next we will do is add an ADO.NET Entity Data Model item to our project, name it appropriately for the Data you are modeling after and click Add. Thats a heap a code I know, and there are other ways to do this, Im sure, this is just “my way”, you will notice I am employing the Using Statement to encapsulate the Context of the Data Connection then Im either Creating, Updating, Deleting and as in the case of Reading I have one that returns everything and one that returns just one. THATS IT for the Code part of this!!! Once all of that is done, you will NEED, YES NEED, to modify the App.config file because it still thinks that the Service Contract is tied to IService1.cs that we deleted earlier. We can also create other endpoiints, yada yada, but thats anotehr story. So here is what you need to do for your App.Config. 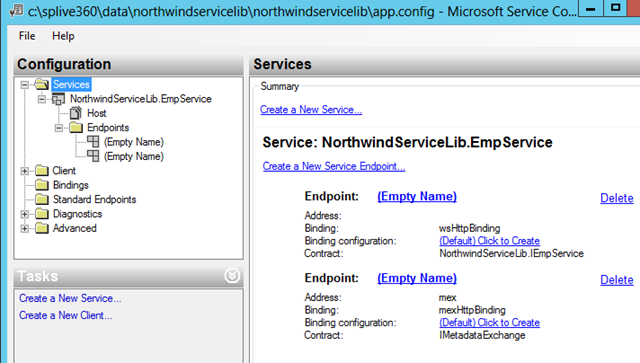 Right click on it, and click “Edit WCF Configuration”, when you do you will need to change the Service to your EmpService by browsing to the Bin Directory and clicking the Dll & you will also need to set the Contract to IEmpService by doing the same. You will notice I have two endpoints as well, one for the Service Contract endpoint and the other is MEX for the announcement of the Service. 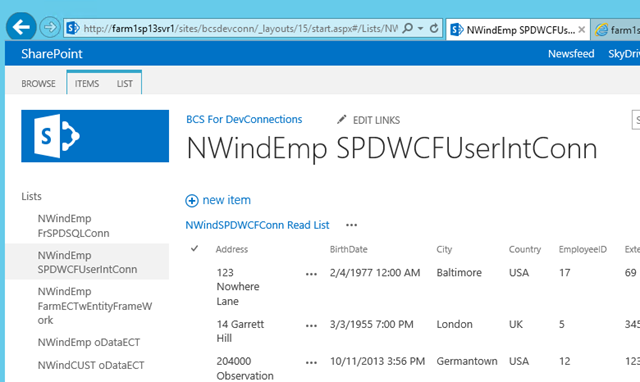 Now that you have done all that you can certainly test your work even before it goes into IIS to be hosted outside of Visual Studio. You can do that by using a nifty tool inside your Visual Studio Command Promt called “WCFTestClient.exe” and passing it the URI of your Service, but the easiest way is just Press F5 in Visual Studio and it will do all that for you LOL, we will use the tool later on when we move it to IIS. Just for giggles sake, I will just test the GetAllEmp for this blog. IF you want to see more come see my VS Live 360 Session that i spoke about on my blog here. As you can see above, we have the Service exposed and all the methods, and we invoked one them and we can see the results there. 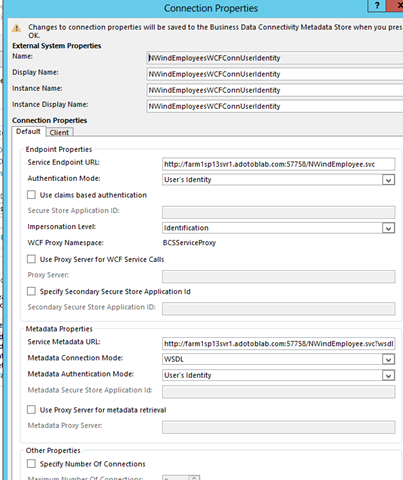 Now unless you want to have to start up Visual Studio every time you need to use this WCF, what you need to do is host this in IIS or you can do TCP or NetBinding but We are all working in SharePoint for this blog so we need IIS. 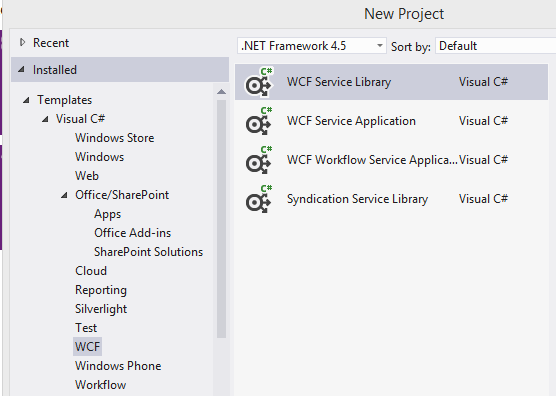 Its simple, just add a new Web Site Project to this Visual Studio Solution; for this we will use the WCF Service Template. 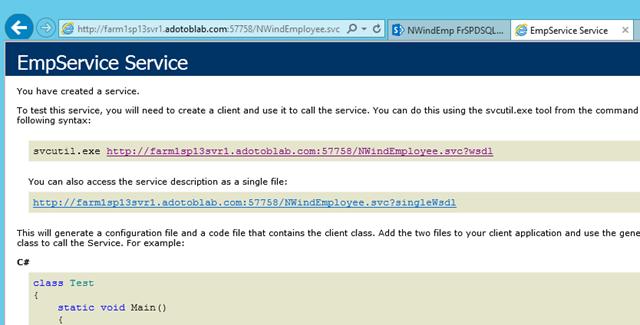 This too will add a sample implementation again in the App_Code folder which includes Service1.cs and ISerivce1.cs. 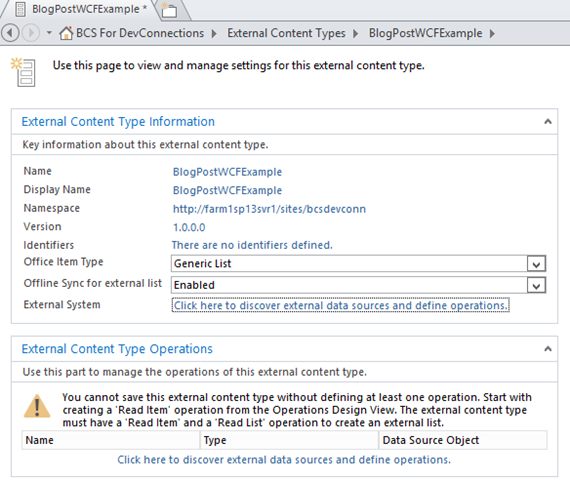 Delete those again & and set a reference to the WCF Service Library DLL from the first project. If you are asking why we deleted both those files again its because we will be using the files from our first project referenced in our .svc page. Your solution may look like this now. 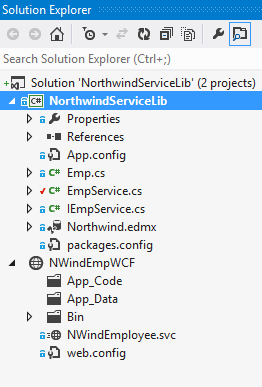 You will also have a file called Service.svc, that we will rename to something more descriptive of our Service we are trying to expose, I name mine NWindEmployee.svc Once you have renamed it, you will need to set the Service to the Project Namespace and remove the codebehind attribute since we wont need it. Now you can test this guy again using the Test Client, but the hosting into IIS Is quite simple and Ill just show you that. 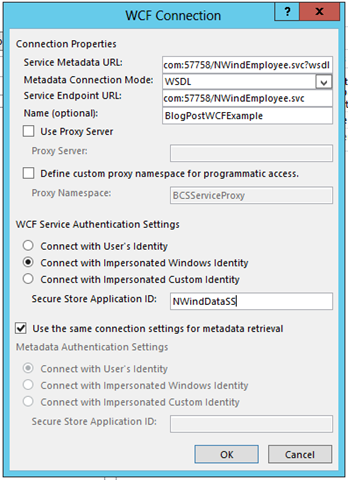 All you have to do is either (1) Publish the site into a new Directory for PROD consumption (2) just copy and paste the folder where you want on a box running IIS and create a new Web App / Site pointing to that location and setting a FQDN and as in my case a port number where it can be consumed. 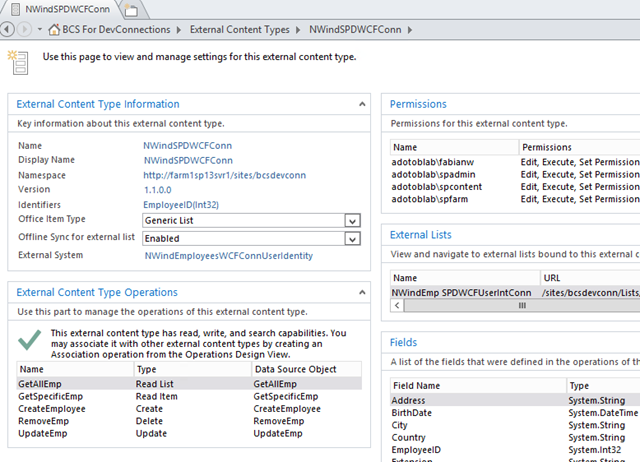 Now we will use SharePoint Designer to Create an External Content Type (ECT) that will consume this WCF. So, that is it for my Part 1 of 3, I will tackle the next one later tonight or tomorrow. Cheers, hope this helps, let me know your thoughts, critiques, etc. When I test my service from our network, it works fine, when I’m not authenticated into the network, I get the following error from the https://ehealthservices.xxxx.org/ecats/ecatsosr.svc?wsdl address, Any idea what would cause this? So, if this is an open end point i.e. not using certificates or any other authentication mechanism in the web.config then what you get on the inside is what you should get on the outside as well if published properly. That said, this is simple http/s traffic so I wouldn’t suspect a firewall blocking it UNLESS you specifically restrict it via some rules. The error indicates that there is no endpoint listening, did you try to ping it? are you getting responses? if not, then I would expect the error you are getting. The fact it is working internally and not externally lends itself to a networking issue and not web service issue. Id begin by doing a ping, trace route to validate connection and then move from there. 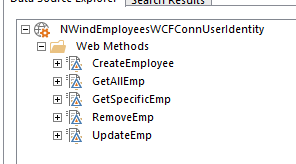 ohh one other thing, why don’t you try to use fiddler to hit the end point outside of sharepoint then you can inspect the headers and see what is happening. 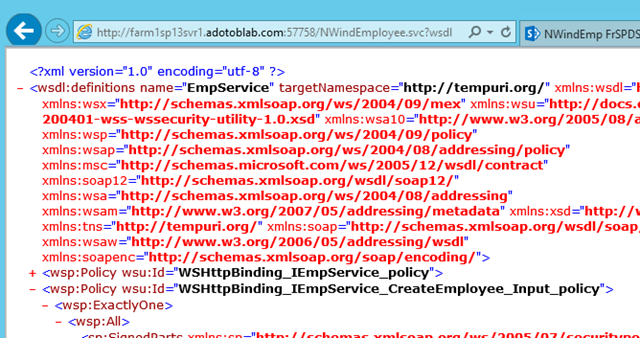 and if you are using SPD wCF configuration make sure in the metadata url you have the ?wsdl and in the endpoint you don’t. Thanks for taking the time to write these helpful articles. 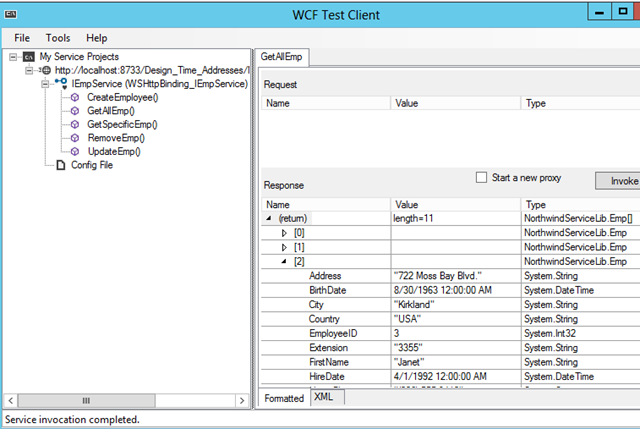 I am on this part highlighted below but I can’t to find the WCF Data Template to add to my solution. I am running VS 2013. Please point me in the right direction. Thanks! If you have any Web Project you should be able to add “WCF Data Service” maybe because the word template it was a bit misleading. Just wanna say thank you! I spent hours trying to figure out how to create this type of the list and work with BCS correctly. You are quite welcome. Happy to help.